It has been a while since my last restaurant /food review. Sorry about that, I have been eating more home-cooking and less outside. 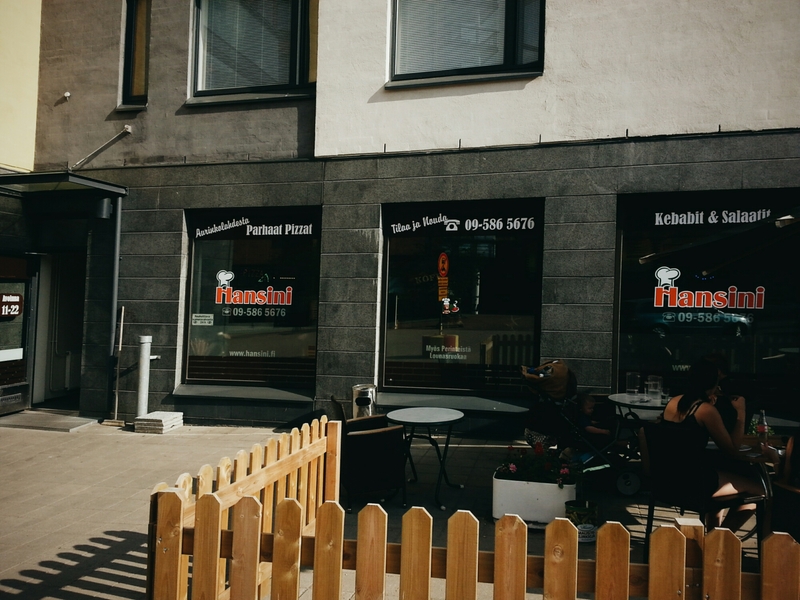 Anyway, today I had the chance to test Restaurant Hansini in Aurinkolahti (Vuosaari district of Helsinki). I have been aware of this place for a while but I believed it to be your regular pizza/kebab place of which there is no shortage in Helsinki. However I was thinking about a pizza so I stumbled upon their menu. Which had Sri Lankan food on it as well. No, this is not your average run of the mill neighborhood pizzeria/kebab place. 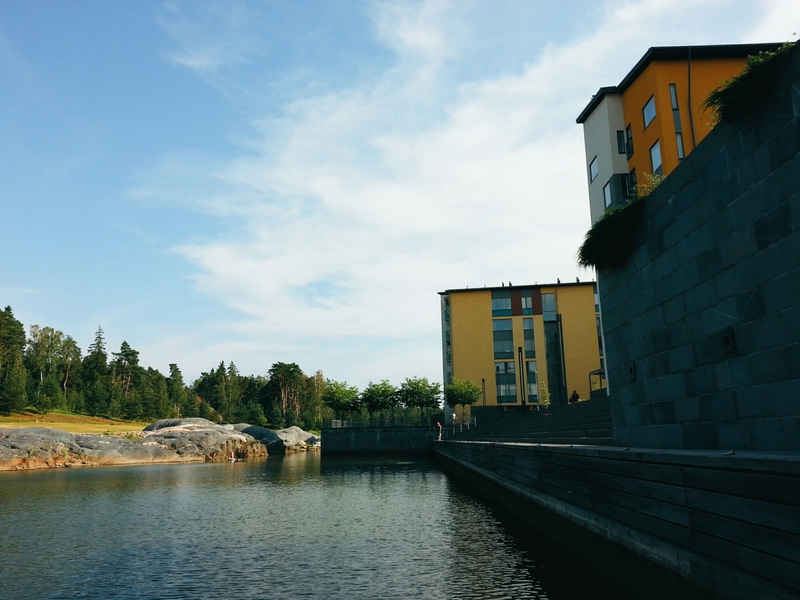 Hansini is located right beside a canal in Aurinkolahti, on the eastern side of the district. The place was really hot inside as we are enjoying a very warm spell at the moment. Spur of the moment: they do take-away portions at the same price, so a couple of dishes and a lemonade and to the side of the canal to eat. Running water and shade. What more could you possibly want on a very hot day? As you can see, a nice spot to sit down on some terraced concrete and enjoy a taste of a cuisine I really love. If you have been reading my blog you will know I love Sri Lanka and have been there a few times and was there last autumn. So it was great to see if I can get some proper Sri Lankan food. 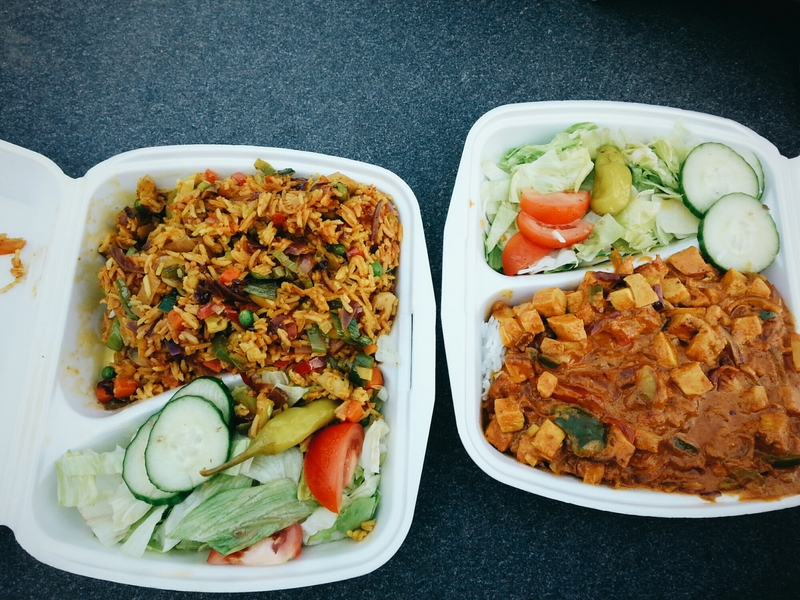 The dishes from left to right: vegetable with rice and curry. Chicken with rice and spices. The food was to be expected, a little toned down for Finnish taste. Spicy, but not so hot as the dishes I have enjoyed in Sri Lanka. The restaurant will however upon request do the full-blown hot stuff as well.. Next time I think. Anyway, the veggie dish was very nice and not too spicy with a lot of nice tasting parts in it. The chicken had a bit more bite in it but not too much. All in all, a very very positive a experience. Highly recommended. Spring rushes on with amazing speed. Soon there will be leaves in the trees and everything will turn green. 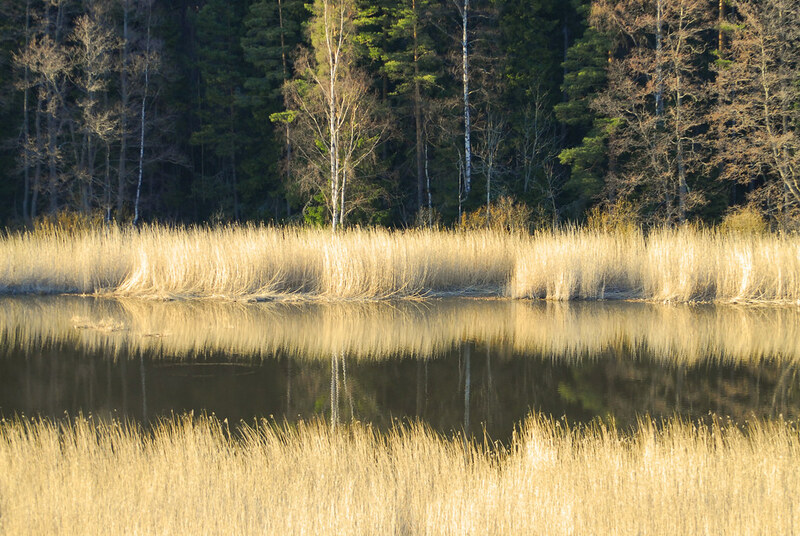 At the moment though, the colors seem to be more golden and yellow as there has been a dry spell for a while in Southern Finland. We have also been enjoying wonderfully warm weather since the beginning of Easter. Golden hour is a great time to photograph the nature. 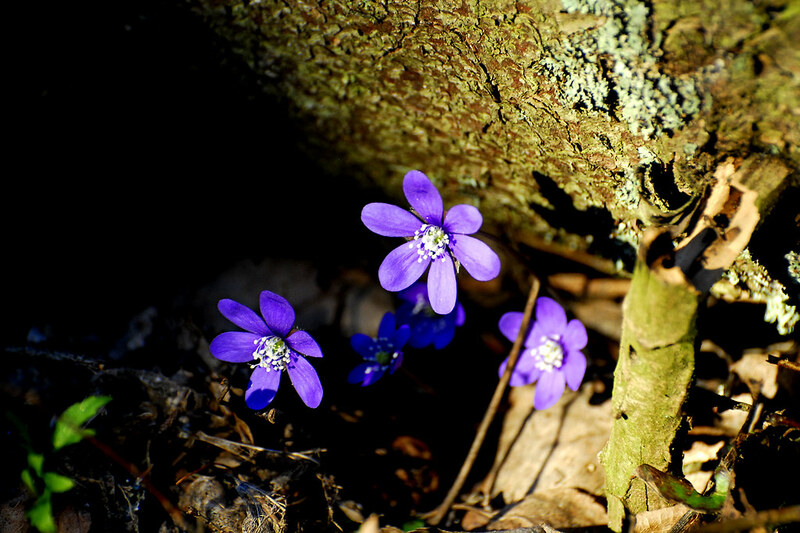 A hike along one of the citys many small forests was by intention for fitness, but I took a camera along for the ride. Birds were not very co-operative and did not come close enough for a proper shot so I chose those subjects that were available.. Between the photos taken there was a small forest. And a herd of wild white-tailed deer. Unfortunately there was a lot of brush and they were very fast, so no photos of those beauties this time. Autumn is slowly but surely advancing. Still the days are relatively nice with temperatures in the region of +5-15. The sun still rules. It is surely one of the best times to enjoy the outdoors. The trees are gold and red with green still thrown into the mix. Lovely to go out and hike with some bread and hot chocolate in the backback and a camera on the shoulder. Forests are quite damp now which means that mushrooms are also to be found in numerous amounts and different varieties. Great way to get a little extra enjoyment to the food table. Of course one needs to know which are edible and which are not. So one needs to be careful in the collecting phase and sure in the cooking but the rewards can be mesmerising. Finnish woods are filled with rocks and stone formations. Some of them just beg you to climb them. Others are small but sympathetic. Lonely trees can be very enticing to photograph and they draw my eye. Like this example on the way upwards towards the peak. Helsinki has three high vantage points, hill-wise speaking. This is the path to the peak of the easternmost peak in Vuosaari. The landscape is lunaresque as this is a landfill site which is slowly turning into a hiking and outdoors destination as the nature takes over the man-made peak. SLowly fading the Sun gives it glow for a brief moment more and the landscape is lit beautifully, romantically. Crude rocks shimmer and give a contrast to this shot. Another from the same evening, the swirl of the clouds in the sky contrasted by the nordic sun.